Some 80 percent of the lushly green island with eight miles of pristine sandy beaches was named America's second national park—Mackinac National Park—in 1875, and the entire island has been a National Historic Landmark since 1960. Thanks to extensive historical preservation and restoration work, eight places on the island are listed on the National Register of Historic Places. There are even fragile structural remnants of the island's 700-year Native American history before European explorers arrived in the early 1600s. The charm of vintage architecture and one-of-a-kind shops along the main street give visitors a sense they are strolling through a bygone era full of character. There are reminders of island history dating back more than 400 years, from the Native Americans who used Mackinac Island as a resort and trading center, to the French, French-Canadians, and British who settled here. An imposing statue of Jacques Marquette, the Jesuit priest, and Great Lakes explorer whose late-17th-century mission made the island a fur-trading center, stands near the bluffs watching over Fort Mackinac, built by the British in 1780. If you choose to join the 15,000 or so tourists who stay on the island in summer, you can get here by ferry, private boat, or daily charter air service from the mainland. Accommodations range from the Victorian-era Grand Hotel, built in the 1880s by the boat and railroad companies seeking to capitalize on a surge of tourism, to large clapboard cottages from that and other eras. For a relaxing stay on this time-out-of-mind northern island, you'll want to partake of the isle's accommodations. 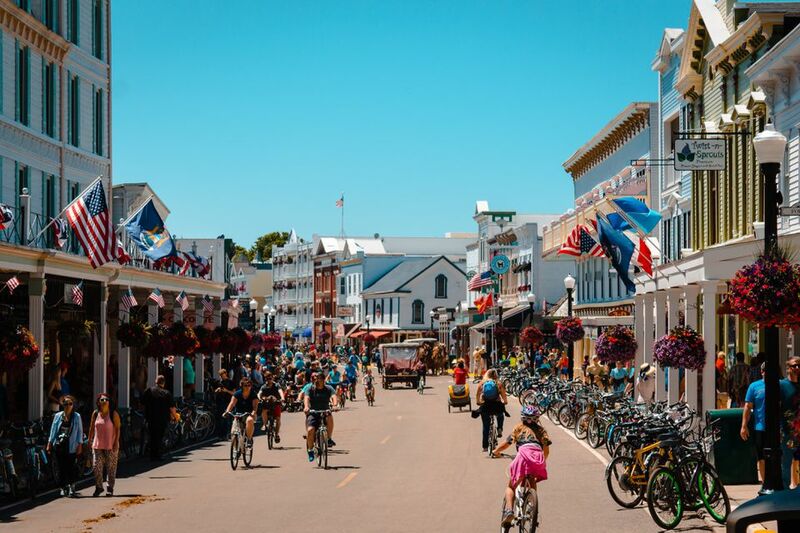 So here are the top places to stay on historic Mackinac Island, including large resorts and smaller hotels, small inns and bed-and-breakfasts—all specializing in a charming, early 1900s atmosphere—and recently built condos. Amenities range from great food and views two steps from your ferry to a fireplace and Jacuzzi in your room. Amenities: Hotel packages include access to the longest front porch in the world, meticulously groomed lawns, entertainment, and meals. Multi-course gourmet dinners are served under chandelier light in the long dining room. Rooms and Building: The rooms are spacious, obviously updated, nicely decorated and outfitted with lots of pillows and extra coffee. But make sure you ask for a room with a water view; some at the back of the hotel have virtually no view at all. The building also shows signs of age in places. Amenities: The resort's biggest draw is its location facing the waterfront and the "bicycle highway," known as M-185 or Lake Shore Boulevard. The Mission Point property includes tennis courts, a putting green and a large lawn filled with Adirondack chairs. The resort also has an awe-inspiring lobby in the main building that includes four fireplaces and an impressive, tepee-like atrium lined with rough-hewn logs. While the Mission Point Resort offers several amenities for kids and families, most can be enjoyed whether or you are a guest or not. Built in 1858, Lake View Hotel is a family-friendly establishment across the street from the Arnold Mackinac Island Ferry harbor and a four-minute walk from Jewel Golf Course. While its name is a bit of a misnomer—for the most part, it overlooks Lake Shore Boulevard, not the water—this doesn't detract from the hotel's convenient location. From the outside, it looks a little tired, but the inside has been extensively renovated with rooms off a multi-story atrium that overlooks an indoor pool. Named Condé Nast Traveler’s “Best Small Hotel in the World” for three years running, the refined Hotel Iroquois is a three-minute walk from the Star Line Ferry dock and 0.4 miles from Fort Mackinac. This lovely boutique hotel is conveniently located at one end of the shopping district along the waterfront. Comfy Adirondack chairs dot the lawn, and it has an excellent fine-dining restaurant, wonderful hospitality and beautiful rooms with special touches. Great Location and Meals: Bay View of Mackinac is located right on the water overlooking the docks. The rooms are somewhat small, but this fact is more than made up for by the extra touches. For instance, the building has a rooftop patio with an unparalleled view of the lake and downtown area. The Inn also includes sit-down breakfast and dessert hour that is served by waitstaff in a nicely appointed dining room. Good Value: Cottage Inn of Mackinac is a small bed-and-breakfast located off of Market Street with recently updated rooms and suites. The prices are some of the best in town, the owners are charming, and the complimentary homemade breakfast and the afternoon treats are delicious. You'll get a good night's sleep here on pillow-top mattresses. Good Combination of Amenities: The quiet Inn on Mackinac is located on Lake Shore Boulevard halfway to Mission Point. The colorful building faces the water but most of its small but nicely furnished rooms are located down its length and don't have a view. This bed-and-breakfast has lovely features, such as a roof-top pool, balconies and a coffee café overlooking the boulevard. Breakfast is served buffet-style in the dining room. Large Inn with Great Location: Island House Hotel has a prime location on Lake Shore Boulevard that is set apart from the busy tourist stores and restaurants. A Historic Hotel of America and a State of Michigan landmark, it may have smallish rooms, but it offers sweeping harbor views and a full complement of amenities, including a heated indoor pool with hot tub and sauna, two restaurants, on-site bike rentals, and a picturesque veranda and terrace. Romantic: Market Street Inn, built in 1900, is a quaint bed-and-breakfast with large, renovated rooms obviously designed for romance. In fact, fireplaces and Jacuzzi tubs big enough for two are available in some rooms. The “breakfast” part of the experience is ordered through a door-knob from the night before, then the meal is placed outside your room in the morning. Large Rooms and Grounds: The pretty, pastel Metivier Inn is one of the larger bed-and-breakfasts on the island and is set a little apart from the worst of the tourist traffic on Market Street. The rooms are nicely decorated and spacious. A large, wraparound porch gives guests a place to sit and soak up the Mackinac Island atmosphere. Mackinac Island has more than 1,500 lodging rooms, condos, and apartment suites. While there are some new condos for rent along the waterfront, the biggest condo communities are located about two miles into the Island's interior on what was once a large estate. Situated on a cliff overlooking the Ambassador Bridge, the condos have a beautiful view and a tranquil location. Getting there can be a challenge, given the two-mile hike uphill, whether you get there by bike, on foot or in a horse-drawn taxi. Amenities: The condos and apartments are relatively recent additions to the island, which means they are more modern and provide more living space than other overnight options. In fact, the condos often include a kitchen and a living room. The Mackinac Tourism Bureau has a list of properties and contact information.